I’m surprised how often I hear people say they don’t like sitcoms. They are often described by the following terms: not realistic, too jokey, not funny, simple, and stupid. What people usually end up meaning is they don’t like multi-camera sitcoms. They do like some sitcoms but prefer the “smarter” comedies of the single-camera world. Multi-camera sitcoms tend to get a bad rap because of their use of laugh tracks. Our minds also can’t seem to move past the overly schlocky premises of some 1980s sitcoms. These haters somehow forget about the eye-rolling single camera shows that have been televised. What they also fail to realize is that single and multi-camera sitcoms have many similarities and that their differences tend to be in the technical side of things and not in the quality of the material. Let’s dispel some of these rumors about single and multi-camera sitcoms. Multi-Camera shows are not realistic like single camera shows. All sitcoms (single and multi) play in a heightened sense of reality. 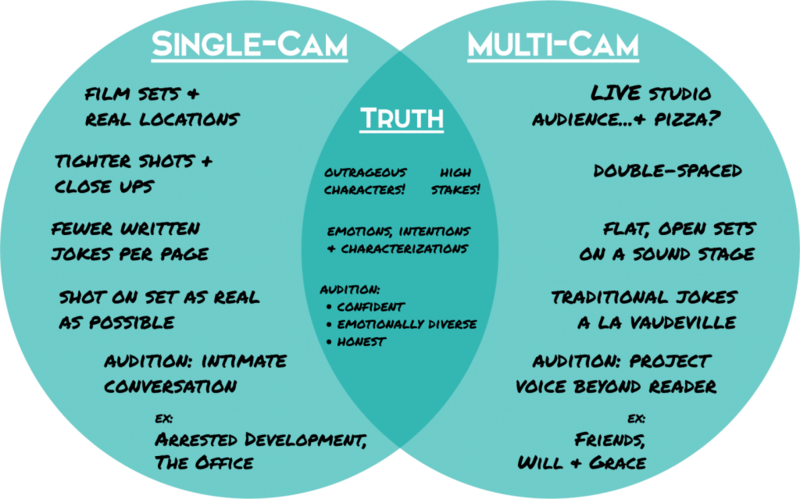 Multi-cams are not bigger and broader in tone or acting than single camera shows, they are more theatrical because they play in front of a large, responsive audience. Single camera shows are just as big, broad, silly and goofy (Arrested Development, Better Off Ted, Scrubs, The Office, New Girl, The Goldbergs, Modern Family, Fresh Off the Boat, The Muppets, Brooklyn Nine-Nine) as any multi-camera show, but we don’t immediately recognize them as such because we don’t hear an audience reaction. We aren’t prompted with a response that indicates, “What he just did was crazy!” Instead, we are left to our own devices to react how we choose, and more often than not, we’ll respond the same way would have if it were a multi-camera. We assume single camera shows are more realistic because they are written and shot with an intimate and cinematic feeling (no live audience, tight shots); however, multi-camera shows are as equally realistic but their theatrical quality makes it seem less real to those people who feel like they are being told how to react. Multi-Camera shows are jokey whereas single camera shows are not. All sitcoms are based on jokes, be that spoken or visual. While single camera shows often have fewer written jokes per page than multi-camera shows, they can sometimes have just as many overall jokes in a show because of the rapid fire delivery (no holding for laughs) and the ability to add visual jokes due to the way they are shot. Single camera jokes tend to be more nuanced and subtle but they are always there. Multi-camera shows are joke-heavy but also have limitations because of the necessity to hold for the live audience reaction. They often rely on the ‘set up-punchline’ format for humor, which is why they are perceived as “jokey”. You can argue that the single camera’s version of the multi-camera’s ‘set up-punchline’ style is its constant use of the flashback. Watch any high quality single and multi-camera shows and count the number of jokes each has in the span of its ~20 minute run. You’d be surprised in the closeness of the final tally. Single-Camera shows are smarter than multi-camera shows. All sitcoms are based on a simple and basic story structure: conflict that is diffused and/or escalated using humor and jokes, which climaxes then resolves itself. How each individual show chooses to attack this simplicity with their storytelling is what makes them smart, not whether they are single or multi-camera. Examples of smart multi-cam shows are Cheers and Frasier. Examples of smart single-cam shows are Veep and Episodes. I wouldn’t necessarily say either single camera example is smarter than the multi-camera ones. Single camera shows tend to be labeled “smarter” because they can do more with the camera and in the editing room than multi-cameras since they are shot like a short film, which makes the viewer think it’s more high brow than a show shot in front of an audience. Single and multi-camera sitcoms are different but mainly in their execution of similar material. This difference may seem major but it’s only one part of the sitcom as a whole. It’s like comparing a college sport to its professional counter part. Some rules will be slightly different, some in-game strategies and tactics will vary due to these differences, but in essence, it’s still the same game. And for you non-sports literate readers, let’s use cooking as an example. You can have two recipes for the same dish, and while the main ingredients will be the same, there will be different spices or add-ons that give each dish its own flavor. I’m not saying you can’t like one more than the other, just know what the differences are before arguing your case. And because pictures are fun, here is a Venn diagram comparing and contrasting single camera and multi-camera sitcoms in a bit more depth to include how it affects actors and writers.